It is finally here! 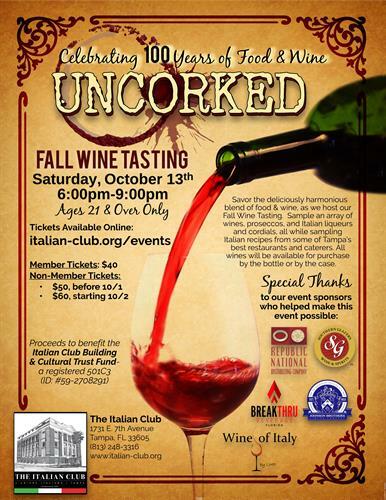 After years of requests to do it - we are finally hosting a fall wine tasting at the Italian Club of Tampa! Join us on Saturday, October 13th at 6:00pm, for "Uncorked: Fall Wine Tasting". Savor the deliciously harmonious blend of food & wine, as we host our Fall Wine Tasting. Sample an array of wines, proseccos, and Italian liqueurs and cordials, all while sampling Italian recipes from some of Tampa’s best restaurants and caterers. All wines will be available for purchase by the bottle or by the case.